Three years ago sometime, around-about a week or two ago I decided to start a blog. This one. I named it for my dear Grandad's nickname for me 'Scallywag' , which means a little bit cheeky, a rascal, up to no good or in my case one small granddaughter with red hair with a big smile who absolutely adored her Grandad. Yep, Grandad, you are the original Scallywag, I know you're somewhere watching over us and I just want to say that every time it rains, I sing and dance in it. Remembering you . Smiling through the rain. I don't care that I'm soaked through. All I remember is you, and your big warm hugs. I would have given you one of those big warm hugs a couple of weeks ago, on your 82nd birthday, but instead we watched one of your favourite films, Pretty Woman . I made cupcakes to celebrate too, as I know that's what you'd want us to do. I know it's been a while but I wanted to let you know, alot has happened since we waved you goodbye all those years ago. I moved to Melbourne with Mum, she's not with Dad anymore, but it's ok, she's happy. It was hard seeing them split up, but I was with her, here in Melbourne, and we both got through it. We laughed alot and we cried and I think she realised that she was stronger than she ever knew (Mum, I know you're reading this and crying right now, go grab a tissue, I love you). She helped me find my first house, it's where I live now and I love it here. Some people think it's too cold in Melbourne, but you know how much I love those winter coats, I have a gorgeous green one, it reminds me of the ones from the old films we used to watch together. Nan spends lots of time with Mum and J now as they all live in Margaret River, I think Nan was surprised to read my article in Masterchef last month , she inspired the recipe for the article, just as you inspired this blog. I love visiting her and kidnapping her for the afternoon to go wine tasting. She's keeping the garden well tended, she'd tell you it needs weeding, but when doesn't it!?! J, well, you'd be proud of the man he has become, fell for one of my friends, they're so happy, you should see his smile these days. Dad travels alot with his surfing competitions (still going strong) and photography, he's happy too and shows us he loves us in his own funny way (always the joker!). Somewhere in all of that I fell in love with a boy , last November he asked me to love him for the rest of our lives and of course I said yes! I think I proceeded to cry for about half an hour, reminding me of that moment in Pride & Predjudice between Mr Darcy and Ms Bennett, towards the end, you know the part , you always cried! I seem to have inherited that gene, crying at all the soppy moments *smiles* We're getting married next year,I know you'll be there in your own special way, but I just want to let you know I'll miss you, so much. So, on this, my round-about third blog birthday I wish to raise a vanilla frosted, chocolate and sprinkles topped cupcake to you; to those who makes us smile everyday. Preheat oven to 175Degrees Celsius. Line a 12 hole cupcake tray with cupcake cases and set aside. In a hand or stand mixer cream together the butter and sugar until light and creamy, almost fluffy. This will take 5 or so minutes and will require the butter to be scraped down from the sides of your bowl a few times. Add the eggs, one at a time along with the vanilla, and mix to combine. It may look a little curdled, but that's ok! Sift together the flour, baking powder and bi-carb into a bowl. Add half the flour and all of the butter milk to the butter mixture and beat to combine.Scrap down the sides and add the remaining flour. Mix on low (or the flour will fluff everywhere!) until the flour is incorporated, then quickly increase the speed to high for10-20seconds. Spoon into your cupcake liners, you want them to be about 3/4full as they will puff up a little. Bake for approximately 15minutes, until a skewer comes out clean. Allow to cool completely. Not just for cupcakes, it's also perfect for over ice cream (just incase you didn't know!) Makes a cup and a bit. In a heavy based pot over low heat combine all ingredients and stir until all the chocolate is nearly melted. Remove from heat and allow the chocolate to melt in the residual heat of the pot. Allow to cool, stirring occasionally so that the sauce doesn't form a skin. If keeping for later, simply pour into an airtight container and pop in the fridge, when you need it scoop out what you need and nuke it in the microwave on low for 10 or so seconds, pour over midnight snack of ice cream and ta-da super delicious unhealthy snack! It will keep for about 2weeks in your fridge...unless you have a midnight snack problem. 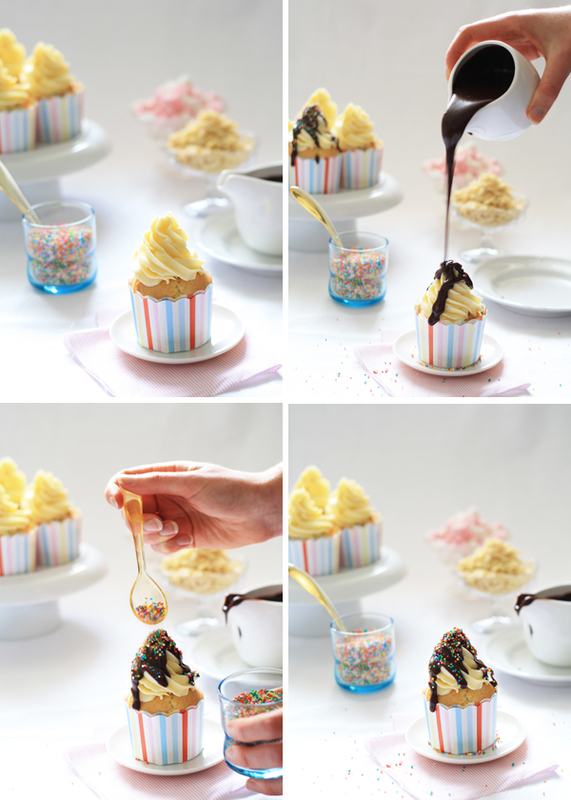 and pipe onto your cooled cupcakes in a 'Mr Whippy' Sundae form. 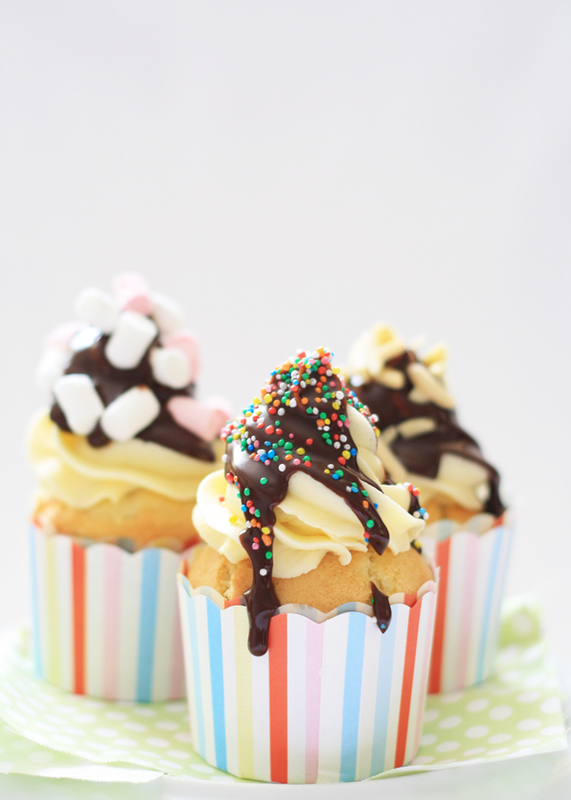 Pour some of the cooled chocolate sauce (you don't want to melt your buttercream) onto your frosted cupcakes, if it's a hot day, you might want to pop the frosted cupcakes in the fridge for ten minutes before this step in order to stop the buttercream from melting. 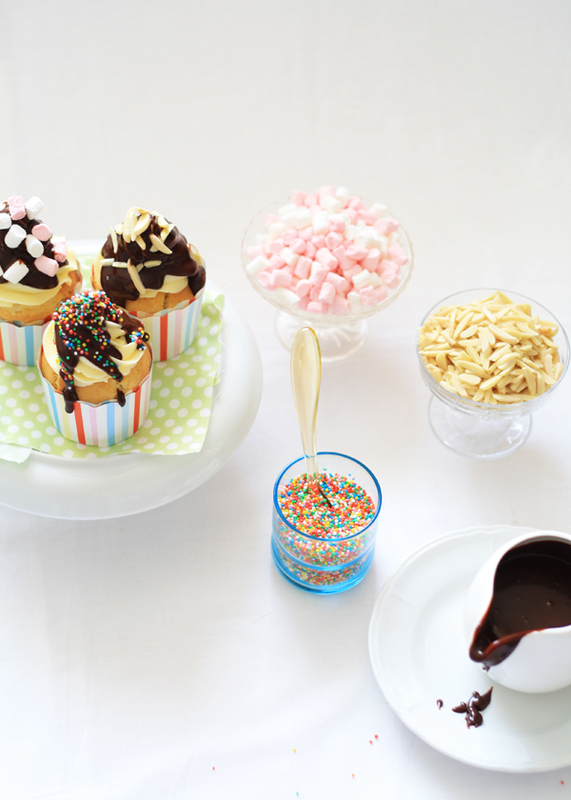 Before the chocolate sauce sets sprinkle with some of your favourite sundae toppings, I found gluten free mini marshmallows, slivered almonds and hundreds and thousands at my local supermarket. Enjoy with your loved ones for your or their birthday. Or "just because you love someone" is a good enough excuse for me.